1. Put the apples in a large pan, add 1.5 litres water, half-cover with a lid and slowly bring to the boil. Reduce the heat to low and cook for about 40 minutes, until the fruit has started to turn mushy and is completely tender. 2. 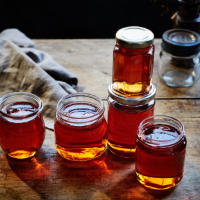 Pour the contents of the pan into a jelly bag or muslin and suspend over a large bowl or pan, letting the juice drip through slowly for at least 5 hours or overnight. Do not be tempted to push the fruit through the bag or the jelly will be cloudy. 3. Measure the juice into a preserving pan; for every 500ml, add 400g sugar – 2kg apples yields about 1.5 litres juice. Add the rosemary and vinegar, then set over a low heat. Dissolve the sugar slowly, stirring occasionally. Sterilise the jars following the instructions below. Put 2 saucers in the freezer. 4. Once the sugar has dissolved, bring the mixture to a steady boil and cook until it reaches setting point (at least 20 minutes), using a large metal spoon to lift off any scum that rises to the surface. To test for setting point, drop ½ tsp jelly onto a cold saucer. Leave it for 1 minute, then push the jelly with a fingertip. If it wrinkles, setting point has been reached. If not, continue boiling and testing every 2 minutes, until ready. 5. Remove from the heat, carefully fish out the rosemary and spoon off any scum that has risen to the surface. Pour into the sterilised jars, screw on the lids and set aside until completely cold before labelling and storing for up to 6 months.